I made some Quilt As You Go blocks for a donation project a while back, and I’ve been eager to try this technique as a whole quilt from start to finish. 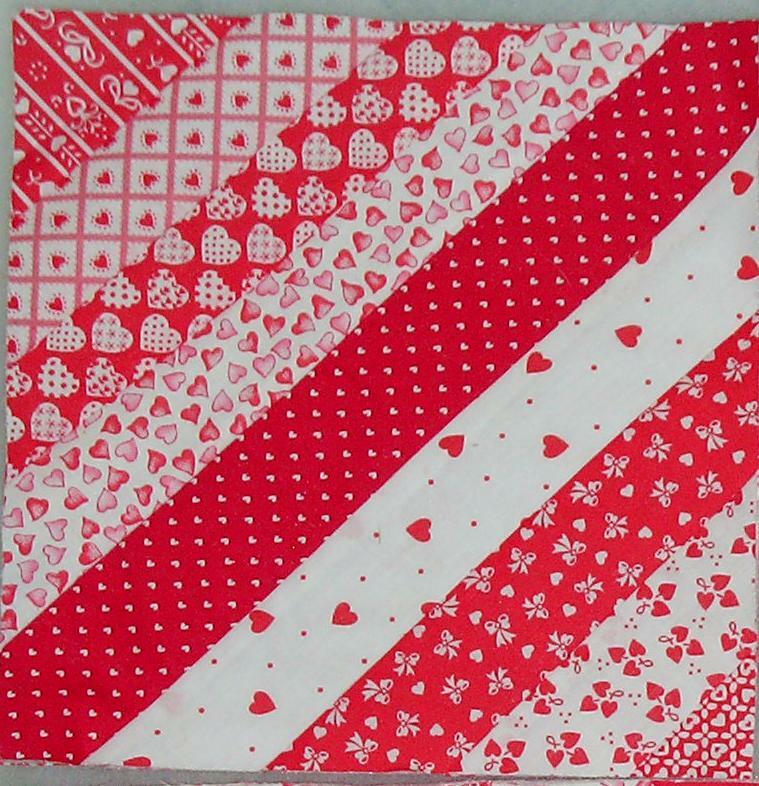 Here are some test blocks using red and white Love Heart prints. I also made a few Log Cabin blocks, but I like the larger String blocks better. The large squares at the bottom left of the picture are the backs of other String blocks. The backs are all red and white prints, too. Welsh Quilter blog has a nice method of joining QAYG blocks together after they are finished. Jan McFadyen also has a two-part tutorial which shows construction of QAYG String blocks and another method of assembly into a quilt. To see what other quilters have on their Design Walls today, please visit Judy Laquidara’s blog. I love your string blocks. Monday is always dangerous for me. When I view other quilter’s design walls it gives me too many ideas. 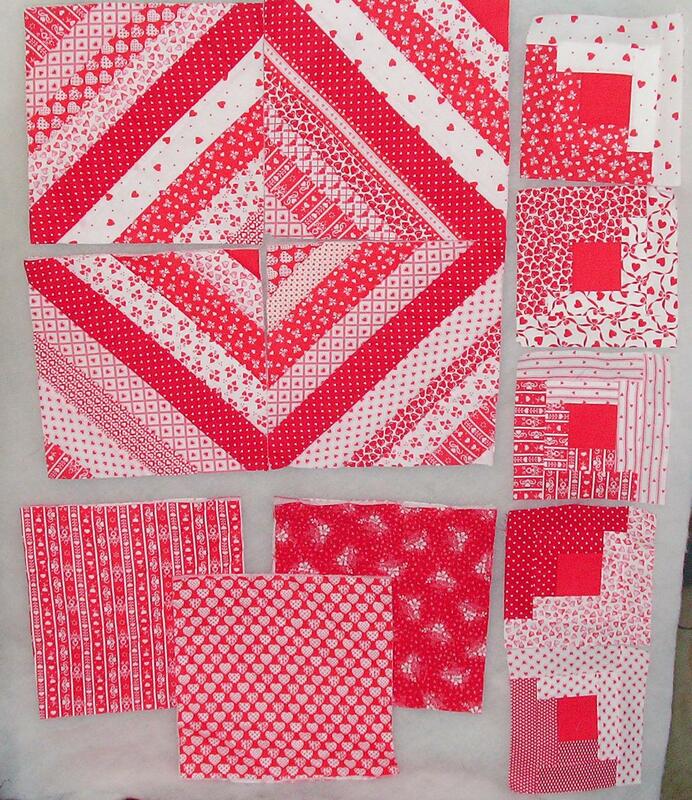 Last week, I went in my stash and pulled out turquoise fabrics (which I actually used in a charity quilt that is almost done) and now I have the urge to run off and find all of my red scraps. I think I will have to stop peeking at other people’s design walls and finish up some of my own projects. At least until I finish my new tree skirt and a few Christmas gifts. I have always thought I would someday try a QAYG quilt, but I just haven’t done it. Pink is so not my color but looking at your wall inspires me to make a pink quilt. what fun. These are very pretty blocks! where did you get all those valentine fabrics? I checked–I have TWO! I love those blocks – that will make such a happy quilt!